Truth be told, although I always run unit tests before pushing I often forget about linting (npm run lint in most of my projects). Due to this, I sometimes push "bad" code (unused variables, inconsistent commas, etc.) to CI, which results in the whole team being notified about a build error. This article talks about avoiding this issue by using Git hooks. To solve my particular issue, I decided to use a pre-push hook. I could also use a pre-commit, but I don't have any issues with inserting an extra commit fixing any linting problems. The commands I wanted to run for my particular project are npm run test-compact and npm run lint. These are executed pre-push, making sure the code I push to online repositories is working. The other command I run pre-commit is npm run apidoc followed by git add ./doc/, which scans the source code for doc blocks, generates the documentation and adds it to my commit (thanks, apiDoc). 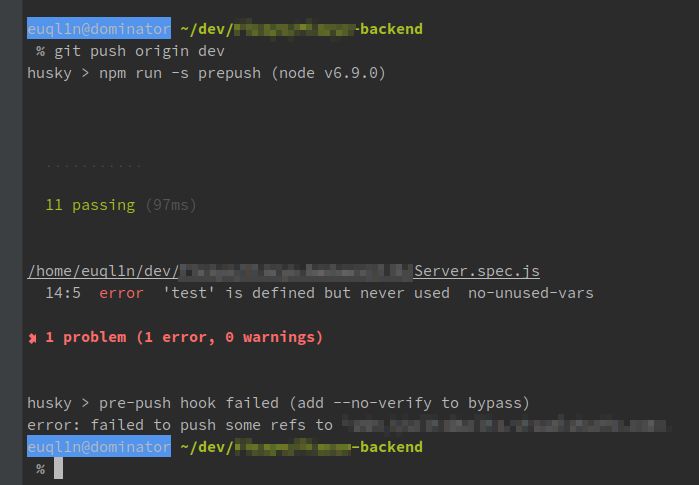 "prepush": "npm run test-compact && npm run lint"
Before I commit my code, apiDoc generates up-to-date documentation and adds it to my commit.